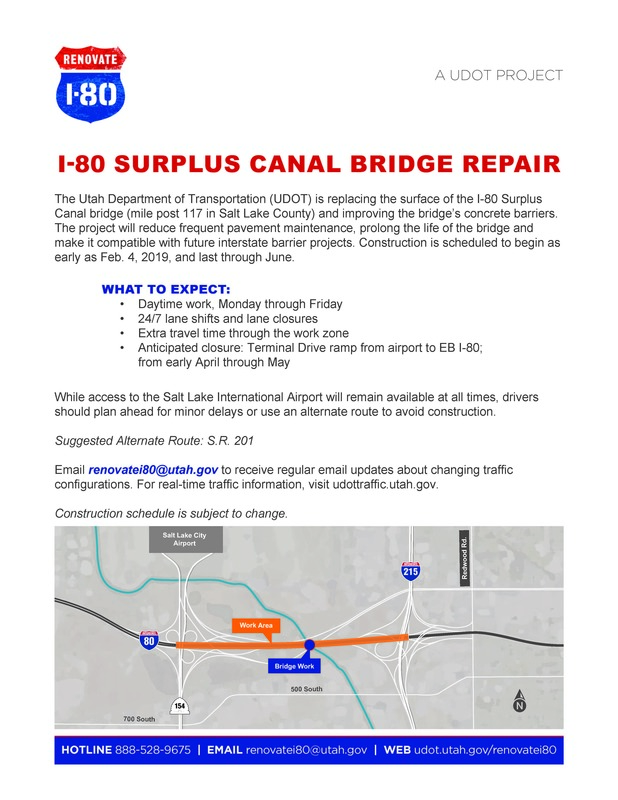 Updated 02/08/19: UDOT crews are working to replace the I-80 bridge surface at the Surplus Canal in Salt Lake City (just east of the airport). Beginning as early as Feb. 8, 2019, drivers traveling westbound from SLC to Tooele can expect I-80 to be reduced to two lanes at mile post 117. This single lane closure will be in place 24/7 to accommodate bridge work. Additional impacts to eastbound I-80 are planned throughout the course of construction, which will last through June. Email renovatei80@utah.gov to sign up for regular updates on the project. Use S.R. 201 as an alternate route to avoid construction and potential delays.